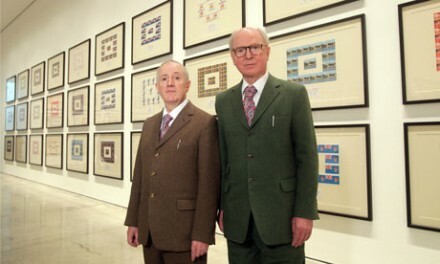 “They made themselves,” Gilbert and George reassure of the 564 postcard works that comprise the Urethra Series, only 155 of which are currently on view at White Cube, Mason’s Yard in London. 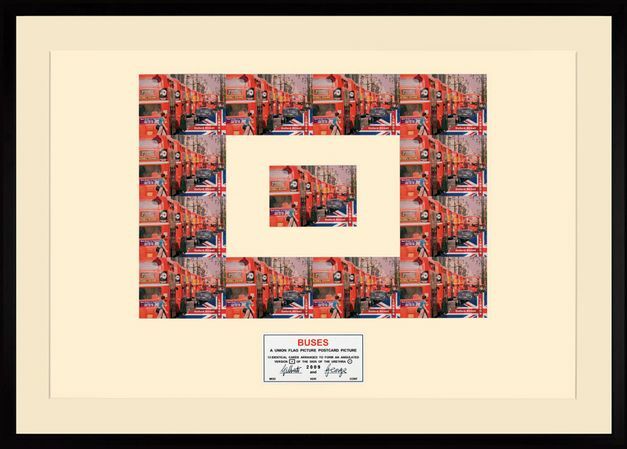 Since their first exhibition of postcard works in 1972, Gilbert and George have continued methodically collecting postcards, phone box cards, fliers and other ephemeral, everyday modes of communication—two collections of which make up the Urethra Series. 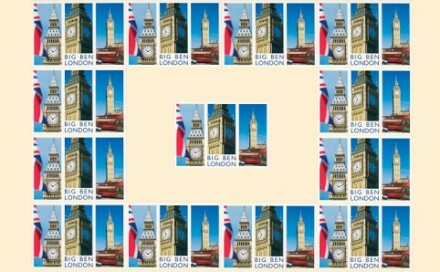 The Urethra Postcard Pictures represent 30 odd years of English visual culture, with images of Parliament and St. Paul’s Cathedral shown alongside S+M adverts and other such handouts that litter London’s phone boxes. 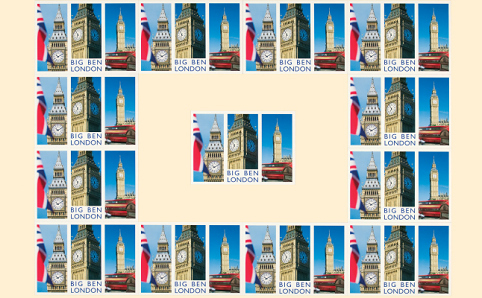 While postcards were easy to buy duplicates of at tourist stalls, finding twelve of the same phone box cards proved more difficult. Finding one “Luke man 2 man horny fit lad 27 years” in a phone box, did not mean more were available. The series poignantly illustrates the way in which modes of communication operate over time. In the 30 years they’ve been collecting phone box cards, London’s phone boxes have been disappearing, and Craigslist has replaced the need for paper advertisements. 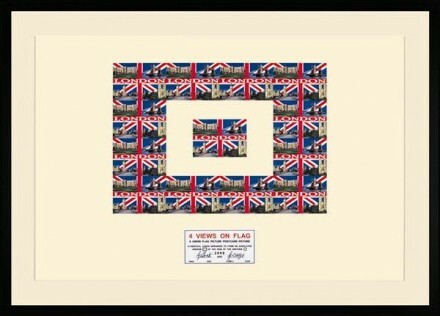 Gilbert and George’s persistent collection of these not-collectibles reveal society’s shifting systems of operation. Postcards document society’s interests when it comes to memorabilia, which has considerably changed since 1972. Gilbert and George consider today’s postcards to be more abstract, detached images. Together, the two collections that make up the Urethra Pictures are two separate modes of societal communication that run parallel to each other—one queer and existing at the margins of society, the other representing mainstream consumer interest. Shown together, their similarities and points of departure provide insight into the changing social landscape of the past three decades. One begins to see formal connections between the two groups and insinuations between their content that Gilbert and George don’t take credit for. They installed the show using an algebraic formula, they say—any connections between content is purely incidental. Charleston Daily Mail September 30, 2011 WVU Saturday: vs. Bowling Green, 3:30 p.m. Oct. 8: vs. Connecticut, noon Oct. 21: at Syracuse, 8 p.m.
Marshall Saturday: at Louisville, 3:30 p.m. Oct. 8: at UCF, 4 p.m. Oct. 15: vs. Rice, TBD Charleston Saturday: at Fairmont State, noon Oct. 8: at Seton Hill, 1 p.m. Oct. 15: vs. UNC Pembroke, 1 p.m. W.Va. State Saturday: vs. Seton Hill, 1:30 p.m. Oct. 8: at West Liberty, 1 p.m. Oct. 15: vs. Glenville State, 1 p.m.
WVU Tech Saturday: vs. Virginia-Wise, 5:30 p.m. Oct. 8: at Virginia-Lynchburg, 1 p.m. Oct. 15: at Kentucky Christian, 1:30 p.m.
Logan to host HYCAT swim meet this weekend The HYCAT Chief Logan Kickoff Age Group and Senior Swim Meet will be held Saturday and Sunday at the Chief Logan Recreation Center natatorium in Logan. The first meet held at the new 8-lane indoor facility will include Colorado Timing System and scoreboard. Leading the 57 HYCAT swimmers will be 2011 Junior National participants Nate Carr and Tate Warden along with 2012 YMCA Short Course qualifiers Morgan Carr and Megan Clemens. Admission is free to the public. The morning session is set for 10 a.m. with the afternoon session beginning at 2:20 p.m.
Wesleyan’s Jackson has interim taken off title BUCKHANNON – West Virginia Wesleyan College Director of Athletics Ken Tyler announced that interim head football coach Jonas Jackson has been named head football coach, effective immediately. Jackson was named interim coach when Denny Creehan resigned this summer to become Director of Athletics at Alderson-Broaddus College. Jackson has led the Bobcats to a 4-0 start this season and they are tied for first place in the West Virginia Conference. Wesleyan travels to Lincoln University (Pa.) this weekend for their final non- conference contest. They will host nationally ranked Shepherd University Oct. 8 in Buckhannon. The amateurs were shut out by the pros in the four-ball matches, sweeping each match. The amateurs got away with just three victories (and one halved match) during singles, with 2011 State Amateur champion, Christian Brand, defeating his mentor, Evans. See Cup results, at left. National sports NCAA cites infractions at Cincinnati CINCINNATI – The NCAA placed the University of Cincinnati on two years of probation Thursday for violating rules on calling recruits in its women’s basketball and football programs. The NCAA said the university discovered the improper calls and reported them. The NCAA infractions committee found a major violation in women’s basketball and secondary ones in football and women’s basketball. The university said the NCAA accepted its self-imposed sanctions, which it has completed. They include restrictions on making calls to recruits during certain periods and on the size of the women’s basketball staff and its recruiters this season. White Sox receive two players in Guillen deal MIAMI – The Chicago White Sox have acquired right-hander Jhan Marinez and infielder Ozzie Martinez as part of the agreement that allowed the Florida Marlins to hire Ozzie Guillen as manager. The Marlins acquired minor league right-hander Ricardo Andres in the deal announced Thursday. Guillen was released this week from the final year of his contract with the White Sox and signed a four-year deal with the Marlins. Marinez’s only major-league experience came in 2010, when he had a 1-1 record in four games with Florida. Martinez had a .258 average in 34 games over the past two seasons. The reigning World Series champion San Francisco Giants currently hold the territorial rights to San Jose, where the A’s hope to build a new ballpark and then relocate – something that could transform the blue-collar franchise into a bigger spender based on increased revenue. San Francisco likely would fight to protect its turf, too. Pitt routs No. 16 South Florida in Big East opener PITTSBURGH -Junior Ray Graham ran for 226 yards on 26 carries and Pittsburgh pulled away from No. 16 South Florida in the second half for a 44-17 victory at Heinz Field. Quarterback Tino Sunseri completed 22-of-33 passes for 216 yards and a score as the Panthers (3-2, 1-0 Big East) outgained the Bulls (4-1, 0-1) by a 523-425 margin. COMPILEDFROMSTAFF, WIREREPORTS Manager Acta’s option picked up by Indians CLEVELAND – The Cleveland Indians have picked up manager Manny Acta’s contract option for 2013. Acta kept the Indians in contention for much of this season before injuries overwhelmed the young club, which finished second in the American League Central. Cleveland went 80-82, an 11-game improvement over last season. Acta was signed through 2012, and the Indians rewarded him by exercising the option for 2013. He’s 149-175 in two seasons with Cleveland. Acta’s staff already has undergone radical change for next season. On Wednesday, bench coach Tim Tolman disclosed he has Parkinson’s disease and will not be back, and pitching coach Tim Belcher stepped down to spend more time with his family. This entry was posted on Monday, January 24th, 2011 at 3:05 pm	and is filed under Go See. You can follow any responses to this entry through the RSS 2.0 feed. You can leave a response, or trackback from your own site.